The premier display industry event, SID DisplayWeek, is now over – and it was a great week. 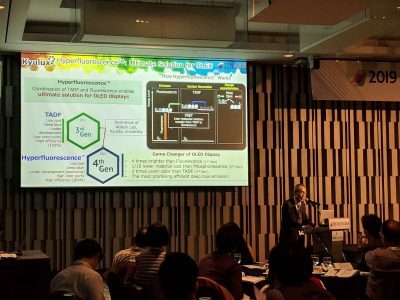 Kyulux had a successful booth demonstration, with a lot of interest from display companies as Hyperfluorescence emitter technology is maturing and is ready to be commercialized. 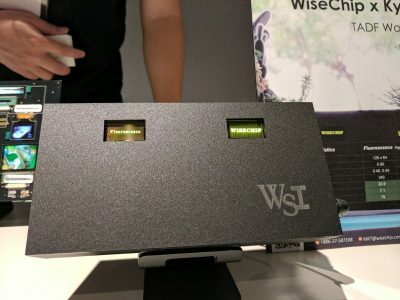 During the show, Kyulux unveiled Wisechip’s flexible HF PMOLED display, which we already posted on. This display is set to be the world’s first commercial HF display, and will hopefully enter mass production by the end of the year. Kyulux also demonstrated a smaller yellow PMOLED HF device, again produced at Wisechip. This is a 0.87-inch display with a resolution of 216×128. 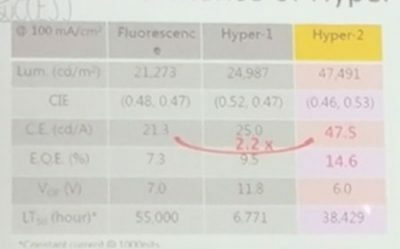 In the demonstration, Kyulux showed how the HF display is almost twice as bright (210 nits vs 110 nits) than Wisechip’s regular fluorescent PMOLED, using the same amount of power.